It is officially winter in the Midwest. 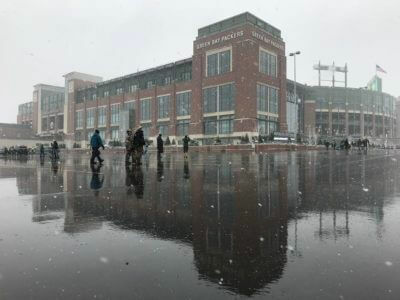 The weather was in full effect on NFL Sunday which meant one thing – football in the snow! 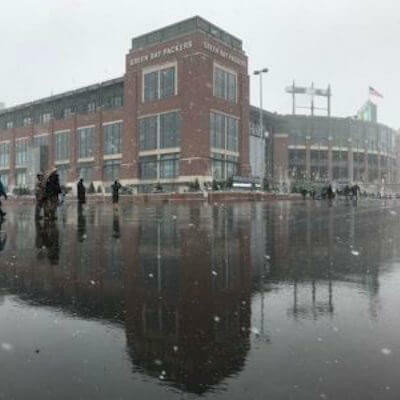 GoTo Team’s Chicago crew teamed up with The Weather Channel to brave the weather at Lambeau Field, home of the Green Bay Packers. I prepped my gear for the wet, cold snow and I also prepared myself for the sub-freezing temps. Our first live hit was at 7 a.m., so we headed out nice and early into the cold. Once the snow began to fall, it fell steadily for the rest of the day. Together with my audio op and TWC’s veteran reporter, Mike Seidel, we walked around the Packers tailgate and got in on all of the action. We interviewed a Packers pep band, the Packers sous chef and rowdy and fun tailgaters. We even tried our luck at the Mannequin Challenge! We went live twice an hour for five hours to give updates on the snowfall as well as the pre-game festivities. We then wrapped by drying out all of the equipment and warming our fingers and toes back up. 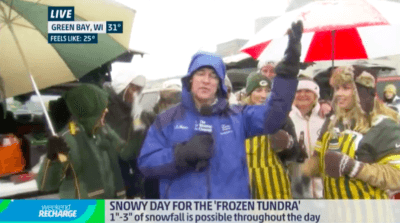 TWC reporters are heroes for going out in the crazy weather all the time! I guess throwing a little football in the mix makes it a bit easier and more fun. 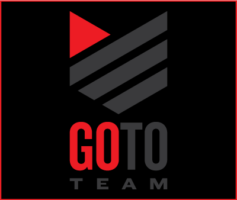 Check out Go To Team’s Weather Channel live hits on YouTube!